In 1852, Commodore Matthew Perry of the US Navy sailed into Tokyo Bay with four ironclad battleships. For the previous 260 years, Japan had completely isolated itself from the outside world, and Commodore Perry came with the demand that Japan open up. Under the threat of naval bombardment by fearsome modern weaponry, Japan capitulated. The nation suddenly remembered the existence of the outside world and realized that it was very relevant. This event—the sailing of black ships into Tokyo Bay—shaped modern Japan. It began the modern history of Japan and remains as a strong national memory. 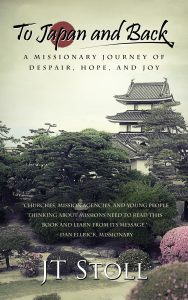 Since the opening of Japan, missionaries have come to this land, and I am but the smallest and most recent of centuries of Christians who have given themselves so that the Japanese people might know Christ. However, even after so long, the work here is still in its infancy: a scant 1% of Japan (if that) knows eternal life. Our work is far from completion, and darkness lies heavy. Today I realized just how much I stick out as a foreigner, and in the back of my mind, the thought came to me: foreigners are black ships in Japan. In most of this country (once you leave the big cities), we’re a rare sight. I attract dozens of stares just by walking down the street. When foreigners show up—ignorant of the Japanese language and culture—it’s a sight to see. My visit to the bank today created scarcely less commotion than Matthew Perry sailing into Tokyo bay. Because we stick out so much, foreigners constantly remind Japan of the existence of the outside, non-Japanese world. On the one hand, some of Japan remains very traditional and nationalistic, but on the other, the government sees the need to “internationalize” Japan. This goal is important because the foreign world is vital to Japan: this country would be bankrupt and starving without international trade. For economic reasons (among others), Japan needs foreigners within its borders in order to understand the rest of the world. But missionaries in Japan are black ships in an even deeper way. We come to Japan to say that there is an outside world and that it is relevant. Most Japanese believe in some form of spirituality, but they do not believe it matters. Religion here does not play a major part in the lives of most Japanese. It’s the here and now, money and industry, that propels Japan. If there is an afterlife, worry about it when you get there. However, Christians declare the folly of this. We say that not only does the afterlife most certainly exist, but heaven and hell are more intensely real than anything we see. Furthermore, in this life, we find a meaning and purpose in God’s love. The Lord is real, and He is Lord of the universe now. Missionaries come in ships that the Japanese have never seen to declare these things to a nation that denies them. But Commodore Perry’s black ships were feared. They displayed Western power to the dishonor of Japan by causing this nation to look like a little child. We are not such black ships. We are the Black Ships of God’s Love. We don’t come for the good of an earthly nation but the heavenly one. And the good of the heavenly nation is the good of Japan: one and the same. We come bearing the love of God, a love that Japan needs more than anyone can imagine. I must pause to give credit to Japanese believers who are faithful to declare the gospel in their own country. They are no less black ships than we foreign missionaries, and in some ways they suffer more for it, because no one expects them to be outsiders. So, here I live as a black ship, sticking out as foreign so that the Japanese might open to a long-ignored world. Didn’t Christ say something about this? How did it go?